I guess not everyone will like the 3 x 2 format of the tubes, but the format was inspired directly by the shape of the case. The video takes you through the way the tubes are mounted, using gallons of hot glue, a trick to make small neons look bigger and brighter, and the WiFi configuration of the clock. Full Disclosure: I make the Nixie Clock Module and the WiFi time provider module! Meet the B-7971 Nixie Shoutbox. You may be wondering what exactly a "shout box" is. The term has fallen out of favor these days, but when I built the Shoutbox in 2007, it was well known. Just about every Wordpress blog on the Internet at the time had some sort of Shoutbox - sometimes called Tagbox - widget installed. The widgets allowed visitors to post short text messages - "shout outs" or "tags" - on the sidebar of the blog page, often anonymously without having to register. Shoutboxes on blogs are pretty much extinct today. I don't know exactly what brought about their demise but I suspect that their open and anonymous nature led to more abuse issues than blog owners cared to deal with. The idea for the Nixie Shoutbox came from the convergence of several of my interests at the time. Do it yourself video streaming was becoming practical and I was involved in the development of some early home security video streaming software. I had been interested in Nixie tubes when I was a teenager and had even done a few little projects with the then-cheap B-7971 tubes. 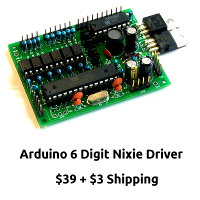 After that I'd pretty much forgotten about Nixies until years later when I happened to run across a site selling Chronotronix (now Nocrotec) Nixie clocks. We're talking about this B-7971, not the other one, which is a Chinese workhorse Boeing, which shuttles between Chengdu, Urumqi and Tianjin. Back in the day (in 1977), those B-7971 tubes cost 50 cents (US) each as surplus. The Shoutbox idea really came together when I stumbled across something called The People's Cam on a site called indigo.org. There was a streaming webcam pointed at a CRT monitor. On the monitor was the old Flying Text screen saver à la Windows 98. Visitors could type a short message and see it appear on the screen saver. I decided to try to make my own version of the People's Cam using alphanumeric Nixies. 16 tubes sounded like a good size to shoot for, and also - since at the time I intended to control it with a PLC - 16 nicely matched the number of outputs per PLC output module. 8 tubes probably would have been adequate but I felt like why not go big "because I can". In the mid-2000s I started gradually acquiring B-7971s as they turned up for sale online. Of course the price of the tubes had gone up drastically since the good old days. I accumulated my tubes from various sources at prices ranging from $35 to $65 per tube. Most of my tubes were bought from EBay sellers in the USA and Western Europe. The Russians never cloned this tube so they weren't available from the "usual suspects". Once the Shoutbox was built and tested I registered a domain, made a web page for it, pointed a camera at it and in 2008 I opened it up to the public. The web page allowed visitors to view the webcam stream and post text on the Nixie tubes. The software handled message queueing which made it possible for multiple visitors to post at the same time and hold conversations. I had created, in effect, a Nixie chat room. I decided to allow people to post anonymously with no registration required and see what would happen. "Everything that does not kill you makes you stronger"
There wasn't much site traffic at first but eventually the word got out. My site was being discussed on Something Awful, Reddit, even 4chan, and the denizens of those sites came in droves. Messages were scrolling across the tubes day and night, mostly people spouting memes or insulting one another - typical Internet stuff. At one point I added some controls on the page that let visitors turn certain lights in the room on and off, so of course I then had strobing lights in my living room as visitors battled each other over whether the lights should be off or on. Naturally numerous visitors tried to break it so I was kept busy modifying code in the usual arms race to plug loopholes faster than the users could discover them. Inviting the Internet into my living room like that was fun for quite a while but eventually it became tiresome. The site had grown to include multiple camera streams and it seemed like every day some camera or cable or capture card would fail and need attention. The traffic would get so heavy at times that all my upstream bandwidth was being consumed by video stream and I could barely use my own Internet connection. Remember, this was 2008 and 1Mbit upstream was considered awesome on a home connection. Finally after several years of running the Shoutbox site and basically having 4chan hanging out in my living room I got tired of it all and shut the site down. For this article I have brought the core feature of the site - the Shoutbox - back online for a limited time. Unforunately, that time is now past. I got sick of stumbling over wires draped through my living room, and while it is certainly nice to see old friends, the enjoyment is somewhat limited if that friend never sleeps, drops around at 3 in the morning to flick the lights on and off a few times, says a few profanities or non-sequiturs and then leaves without saying "thank you" or "excuse me". To give you a little idea of how the Shoutbox was when it was still public, here is a short video of a screen capture of a couple of people playing around on it. For some reason I had the spotlights turned off that day. Probably they were just getting on my nerves a bit too much that day. The electronics can be roughly divided into four sections: power, interface, control and tube drivers. The power section is split between the right and left metal-mesh "cages". In the right side cage are power transformers, a fuse and the connector for the mains cord. The smaller transformer steps the 120VAC mains down to 9VAC which is fed over to the left side cage where it is rectified, filtered and regulated to provide 5VDC for all the logic. The large transformer is a 1:1 isolation transformer: both its primary and secondary are 120VAC. While not strictly necessary this transformer isolates the 120VAC from earth ground, which greatly reduces the risk of spectacular smoke and sparks when probing around the circuitry with a grounded oscilloscope probe. It also decreases the odds of finger-poking onlookers getting a nasty shock, no matter how much they may deserve one. The isolated 120VAC is fed over to the left side cage where it is rectified and then filtered by a couple of rather massive capacitors. This is how I obtain the high voltage needed to light the Nixie tubes. When 120V RMS is rectified and filtered the resulting voltage is 120 * √2 = 169VDC, which is perfect for Nixies. As long as the mains voltage is at least somewhat stable - and it is - this rather crudely derived high voltage is quite adequate for the application. Since someone is sure to wonder why I didn't use a boost converter instead, I will explain. With all 16 tubes lit the high voltage demand is 350mA. That's 60 watts of power. In 2007 I could not just go out and buy a 170V 60W boost converter and I'm not so sure I could even do that now in 2019. I did look into making my own boost circuit but quickly decided that SMPS design was well outside my skill set. The rectifiers, 5V regulator and all filter capacitors are located in the left side cage on what I'll call the interface board. Also on the interface board are several connectors and some pull-up resistors. The Phoenix Euro-connectors along the rear edge of the board were originally for plugging in cables that ran to the original controller - a PLC with 2 16-bit output modules and an Ethernet "sidecar" module that sat on a shelf below the Shoutbox. The PLC output modules provided TTL open collector outputs, hence the need for the pull-up resistors. The present controller, made in 2011, is based around a "naked" (non-Arduino) ATMega 328P microcontroller. Four 74HC595s function as an I/O expanders to give me the needed 32 outputs from 3 GPIO pins. More about that in a minute. A gadget called a Wiz110SR interfaces the ATMega's UART to Ethernet. It isn't a "real" network adapter but it's good enough for this application. It appears as a virtual serial port to PCs on the network. Aside from that there isn't much else on the controller board except a piezo beeper, a backup battery, a header to connect some buttons for setting the time, and Phoenix Euro-connectors along the rear edge of the board that mirror the connectors on the interface board. The controller board is designed to sit on top of the interface board. The boards are connected together with a sort of wiring harness as shown in the photo. It's not terribly elegant but it works! The tube driver boards handle high voltage switching to all the tubes' cathodes with a whole lot of MPSA42 high voltage transistors. Additionally each tube board has 4 74373 8-bit latches configured as 2 16-bit latches. If I was doing it over today I'd probably use the more modern Supertex SIPO/latch/HV-driver combination chips instead of TTL latches and transistors, but in 2007 I did not know they existed. Encoding of characters into segment patterns is handled by the ATMega, not the tube driver boards. The tube boards are perhaps better called "buffer/driver boards", because they primarily latch and buffer data. The ribbon cable that connects all 16 tube boards together and to the controller carries 15 Data lines that correspond to the 15 segments of the tubes, 16 Select lines that correspond to the 16 tubes, and one Go line that connects to the strobe pin of certain latches on each tube board. This sounds a bit like multiplexing but the display is NOT actually multiplexed - only the data is. This is why there are 2 sets of 16-bit latches on each board. One set of latches on every board, which I will call the "back" latches, listens to the 15 Data lines with its parallel data input pins. Each board's back latch's strobe pin is connected to one of the Select lines. A jumper on the board determines which Select line the board connects to: tube board 1 to Select line 1, tube board 2 to Select line 2, and so on. To update the display the controller will output the segment pattern for tube 1 and then fire Select line 1, which strobes the 15 bits of segment data for tube 1 into the board 1's back latch. Then it sets up the data for tube 2 and fires Select line 2, and continues the process all the way to tube 16. At this point the back latches are filled with the new data but it isn't being displayed on the tubes yet. The tubes display the data that is stored in the second set of latches, which I'll call the "front" latches. This is where the Go line comes into play. Once the back latches are filled the controller will fire the Go line, which causes the data in all 16 tubes' back latches to be copied synchronously to the front latches and displayed. This way all tubes update simultaneously. Thus I get the signal count benefit of multiplexing (32 lines instead of an impossible 256 lines) without the flickering of multiplexing. For a device that was designed specifically to be on camera, multiplex flicker would have been totally unacceptable. And that's basically it. To answer a few common questions: Yes, I do have a stash of spare B-78971s. No, I don't want to sell any, at least not at 2019 prices. No, I've never needed to tap into my stash. The Shoutbox has been running 24/7/365 for about 11-1/2 years now with no tube failures. I came across this interesting video a while back, but didn't get around to writing anything about it at the time. It's from a chap called Mario Rigogliosi, who lives in the same town as I do, who has a real passion for restoring old equipment. Have you ever asked yourself "what made Nixie clocks go before microcontrollers were invented"? If you did, I suppose you came to the conclusion that it was switches, levers, relays and stuff". Well, here's a look into that "stuff", and it's pretty interesting. What is written below is based on my best guesses, I'll reach out to Mario and get feedback from him. First of all, the time source comes from the frequency of the mains supply voltage, which is a surprisingly good source of time: supply companies in all but the most dark and backward countries in the world actively manage the number of cycles delivered to the consumer very tightly, even regulated by law in some countries. For example, the supply in the UK can be seen here: http://www.dynamicdemand.co.uk/grid.htm, and on the dial you can see markers for the "Legal Limit" of deviation, over which the supplier is subject to sanctions. This is the momentary frequency, which varies all the time, according to load and generating factors. For example, when people wake up, demand increases, and to meet the extra demands, the suppliers crynk up their machinery to deliver more current, but this also has the effect of increasing the frequency momentarily. To compensate for this, the suppliers manage the frequency over the long term as well, often scheduling a small increase or decrease in frequency over the coming days, gauranteeing over a period of days that the frequency will hit exactly the target frequency. The technology behind syncronous motors is well understood (Synchronous motor) and using these and a gearbox (also well understood) we manage to get the spinning slot wheel, which turns once per minute, and has 60 slots in it, giving the seconds count. Remember that in those days, dividers and counters were huge valve driven beasts cosuming tens of Watts, heavy and with poor reliability. We are before even transistors with this clock. A synchronous motor and a slot wheel was a rational solution to the problem of dividing time. Note that the laser is not in keeping with the original mechanism, which also would have been mechanical, but in order to get the build done, some new components have been used. Once we have a source of seconds impulses, we can use stepping switches, also known as "uniselectors" (Stepping switch) to count the seconds into minutes and hours and so on. Seconds, minutes and hours are totally regular, as long as we don't try to do acrobatics, such as are involved in managing the number of days in the month. Originally, these switches found use in telephone exchanges, where the pulses from the dial on the phone directly moved on the switches in the exchange. These too, were well understood, reliable technology. The only thing I am not able to fully figure out is how the "tens of seconds" counter advances (or resets, I'm not sure) from "5" to "0". There are a series of rapid clicks, which seem to advance the wiper rapidly, I suppose these are wired so that the wiper automatically advances through the numbers "6", "7", "8" and "9". I would therefore expect 4 rapid clicks, but I hear 6 or perhaps 8. Are there two clicks per advancement? Originally the clock only counted hours and minutes, but Mario added counters and tubes for seconds, just because he could. The second video shows the clock in its final form. You can see that there has been a bit of time between the two videos. Many things have changed, but the works are still the same. I was poking around on http://hackaday.com/ and found this: http://hackaday.com/2015/07/14/unusual-nixie-tubes-lead-to-unique-clock/. It's a clock. That's what the title says. My issue was that it was hard to decide what category to put it into, and in the end, only a process of elimination gave me an answer. The title says that it's a tube clock. Those are clearly tubes in there, but is it a clock? It's not based around Numitrons or VFDs, so clearly it doesn't belong there. It wasn't found on eBay, and no one submitted it, so those categories don't fit, either. But I can't quite bring myself to put it in the "Nixie Tube Clock" category, because I'm not sure it's really a clock. So, apparently, according to the Merriam Webster definition, it is a clock, because you can tell the time with it. Only I can't. I guess it is my lack of imagination, or just that I'm neither fluent in octal time nor do the symbols mean very much to me. (Meaning they do, individually, in different contexts, but not here). Octal? Yes, well, the tubes only have 8 cathodes in them, so as well as not understanding the digits, it's not even a number system you can use. Even the guy who made it has a chart next to it to decode the time it tells you. For example, the decimal time"12:34:55" becomes "14:42:67" in octal, or in the language of this clock "FV:VHz:HA". Or something. In any case, you're going to be late for that meeting. Maybe I need to have a new category "Nixie Tube Stuff, but not a clock". I do understand the idea. If you have a box of tubes with symbols on them, and don't make equipment to measure Frequency, Resistance or Volts, what are you going to do with them? I have a box of IN-15s, and I have no idea what to do with them. So, in the end, I put it into the "Non-Clocks" category. Perhaps I'm wrong. Let me know what you think in the comments. Am I a small-minded bourgeois square with no imagination, or should we all have one of these?